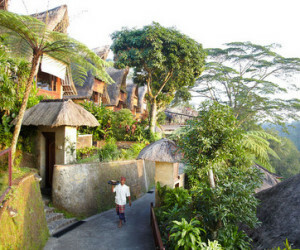 The area of Ubud lies at an altitude of 200-300 metres above sea level and is surrounded by rice fields, which makes it noticeably cooler than other tourist destinations in Bali. 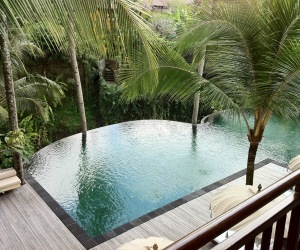 Ubud is surrounded by most of the things that bring people to Bali: culture, comfort, nature and inspiration. You can find traditional dance performances, scenic rice fields, art and craft communities and ancient temples. 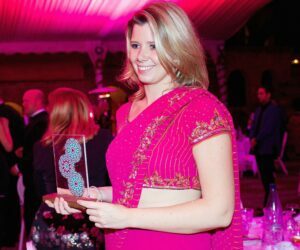 There is a variety of cheap accommodation, luxurious hotels and private villas to suit all pockets. 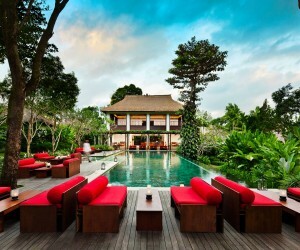 WUS009 - One of the most exclusive destinations in the green rice fields of Ubud, a unique experience not to be missed. 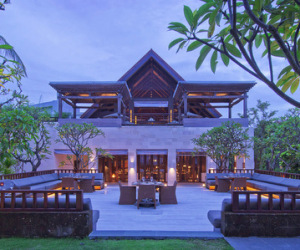 WUC001 - Uma by COMO, Ubud, immerses you in the culture of Bali while also providing luxury amenities, from food to spa to exquisite accommodation—all among the paddy fields and hills of this lush Indonesian island. 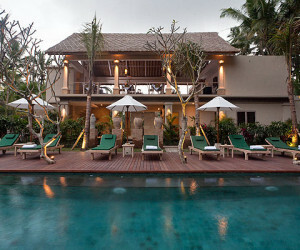 WUB005 - Bambu Indah is a radically distinctive boutique hotel in Ubud area, carefully curated by designers and long term residents of Bali, John and Cynthia Hardy. There is no other place like this. 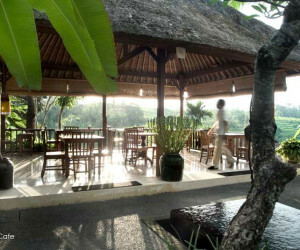 WUP004 - Puri Sunia nestled in its own secluded place surrounded by the natural of environment such as beautiful rice paddies, water, coconut trees, Balinese traditional village of Abangan and Kokokan Village, a home of thousand white herons. 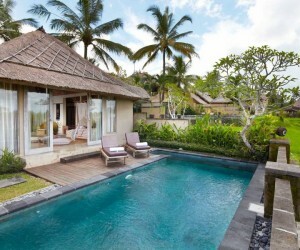 WUK003 - Komaneka at Bisma elegant villas, each with its private pool, and spacious suites are completed with an Indonesian fine dining restaurant, luxurious spa-villa, and wedding chapel. Explore Komaneka at Bisma breathtaking scenery. 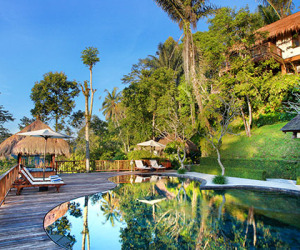 WUM001 - Maya ubud resort & spa is set in 10 hectares of hillside garden, stretching 780 metres along a peninsula set high above two river valleys. It flows from hilltop down to riverside hideaway, 30 metres below. 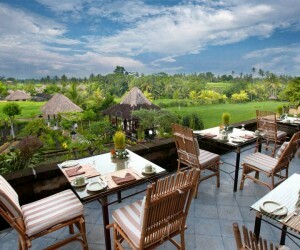 WUU001 - Overlooking an expanse of gorgeous terraced rice paddies, Ubud Village Resort and Spa has a relaxing atmosphere throughout which is further enhanced by excellent service and guest amenities. 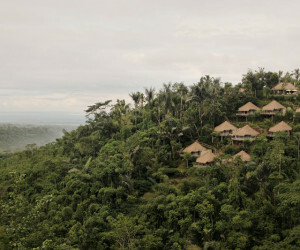 WUP006 - Puri Sebatu Resort set up on 700m above sea level, cool and mist on the edge of the rich green sebatu valley, secluded, tranquil mountain retreat. WUA004 - Located at the amazing river valley and tropical forest, only minutes away from the centre of Ubud Bali, Alam Ubud spaciously set within a 4 hectare river villa and garden landscape. 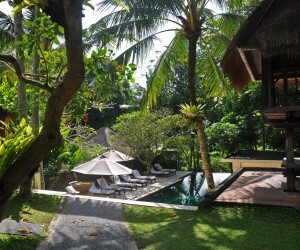 WUK005 - This sister hotel of Komaneka Resorts in Ubud has the same attention to details such as carved local volcanic stones surrounding each bath, and an old traditional house as the restaurant. 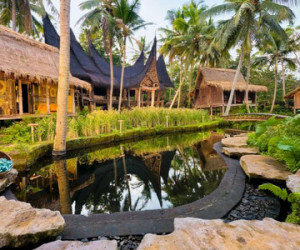 WUP005 - Puri Gangga Resort is a charming luxury boutique resort in Ubud, a home of living cultures where you can experience the richness of Balinese cultures live naturally in the village of Sebatu. WUK002 - Komaneka at Rasa Sayang is perfectly located along Monkey Forest Road with its many wonderful shops, excellent restaurants and easy access to temples, cultural performances, museums and art galleries. 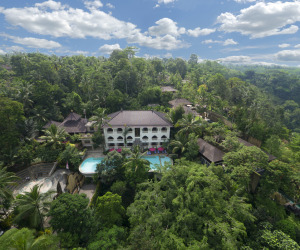 WUK004 - Located in the heart of Bali, Kupu Kupu Barong Villas and Tree Spa is a 5-star hotel enclosed by three hectares of lush tropical gardens overlooking the spectacular Ayung River valley and the rice paddies. 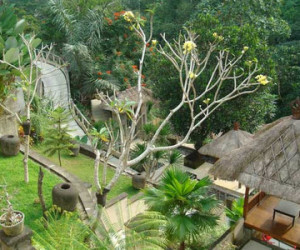 WUN001 - Set deep within a beautiful jungle, with stunning views across the valley, the Nandini Bali Jungle Resort and Spa offers a truly luxurious experience in a pure and natural environment. 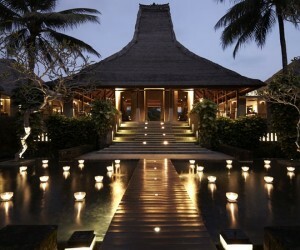 Welcome to the Jewel – the island of Bali…land of a thousand temples, a million smiles and uncounted adventures. 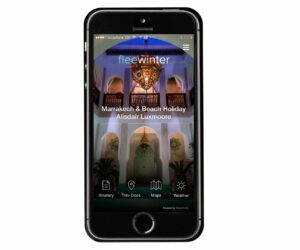 This picture perfect paradise is the destination of choice for those more intrepid travellers seeking to broaden their horizons a bit further than the proverbial sun, sea and sand experience. More than just a mere holiday spot, the Indonesian island of Bali offers an exquisite blend of fascinating culture and enticing Hindu Dharma tradition, with tantalizing and theatrical performances such as the famed music of the Gamelan or the exotic Kecak dance. Whatever may be said about the beauty and diversity of this pearl of an island can hardly do justice to what you find upon arrival. 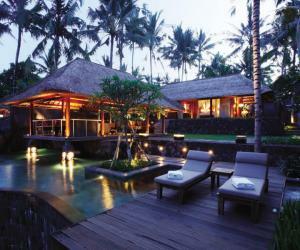 Bali is mostly covered with a lush rainforest, with majestic volcanoes towering over the landscape. 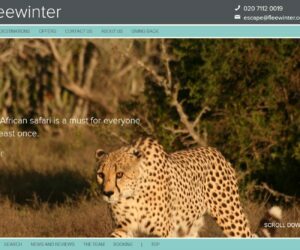 So, if you’re up for some adventure, there’s room for hiking, off road trekking and more. Alternately, take a scooter ride down one the many paths crisscrossing the rice fields through the rolling hills to sample the local delicacy – a world-famed coffee bean known as Kopi Luwak. Just a short boat ride away, Bali’s little sandy sister islands of Gillis and quiet Lombok are another choice for spending a couple of days sunning and snorkelling. West Lombok has a large Balinese Hindu minority that gives this part of Lombok a distinct flair. West Lombok is home to the Balinese era royal palace and several large Balinese Hindu temples. South and East Lombok are more traditional Sasak areas as reflected in the stone Sasak villages in South Lombok. North Lombok is home to Mount Rinjani, considered to be sacred by many inhabitants of both Lombok and Bali, and is where you will find vestiges of an animist culture in daily rituals and practices. 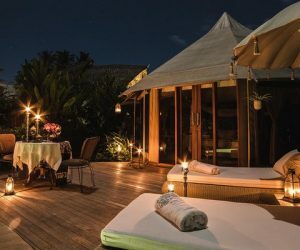 Although Lombok is referred to as “Bali 20 years ago,” it is a culturally distinct and virtually undeveloped island that has numerous unique offerings for travellers. 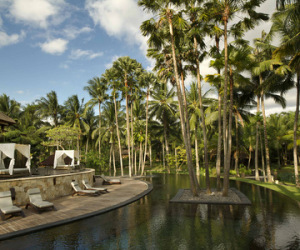 From infinity pools to Komodo dragons, there is something new to be seen around every corner.